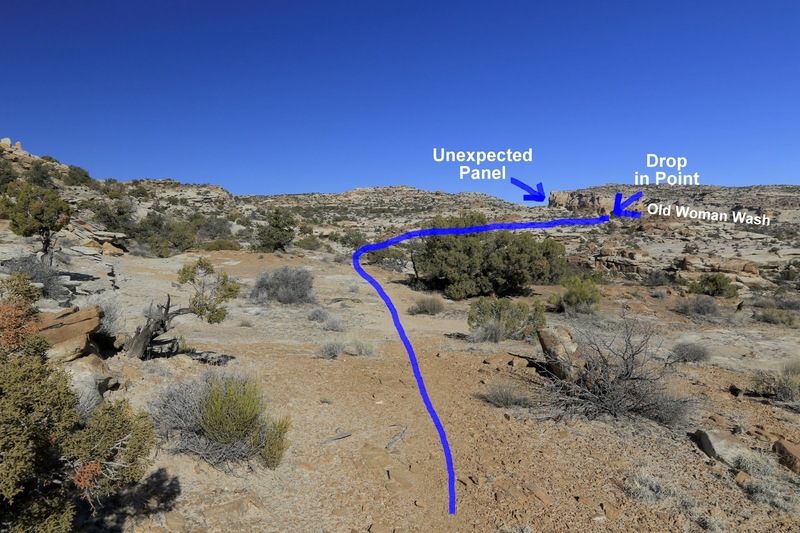 The Unexpected Panel is located at the head of Old Woman Wash in the San Rafael Swell between Green River and Hanksville, Utah. 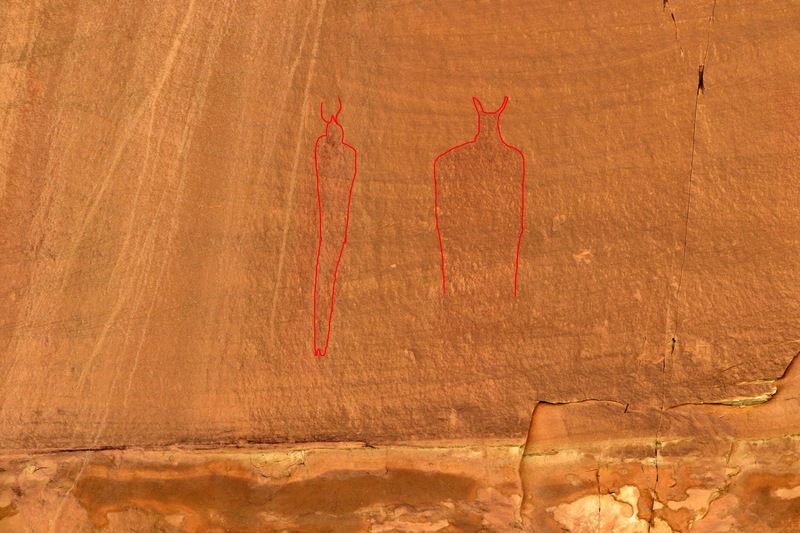 The panel consists of a number of red ochre Barrier Canyon style pictographs and one petroglyph of the same style. Good route finding skills and/or a GPS will be needed to follow the intermittent trail as it crosses the top of the reef to the rim of the canyon above Old Woman Wash. From the rim there is a gap between several large boulders through which to pass followed by a short scramble down into the valley below where you can follow the wash to a trail that leads right up to the site. Getting to the trailhead requires a moderate to high clearance vehicle or other suitable conveyance to cover the 2.3 mile distance from the highway to the trailhead. Begin by measuring 21 miles from Interstate 70 Exit 149 west of Green River, Utah or 22 miles north of Hanksville to mile marker 138.9 on Highway 24. A brown carsonite marker just inside the gate labeled with Trail #922 designates what we are calling the Old Woman Wash Road. Reset your odometer after turning off of the highway. At the 0.4 mile point and the 1.5 mile point stay left. Go right at the 1.8 mile point and right again a very short distance past that. At the 2.2 mile point go to the left where the road loops around the remains of an old fireplace at the trailhead. From the trailhead follow the obvious trail that leads to the normally dry wash and continue upstream into the reef. Stay to the right at the 1 mile point from the trailhead where the canyon splits. 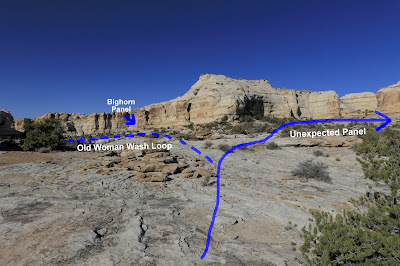 If you were also to do the Old Woman Wash loop you would be returning through the canyon on the left. There is a panel of pictographs plus a few pictographs and old inscriptions on the right side of the canyon right at the point where it splits. They are pretty faded but generally easy to find. 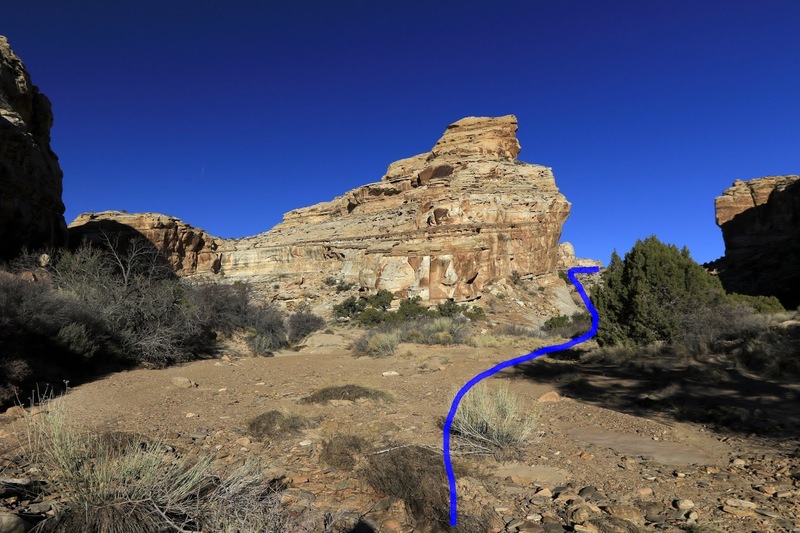 As you continue up the right side of the canyon avoid the temptation to hike up the streambed and look for a trail that is across the wash that travels along the left side of the canyon between the high wall and the wash. There are too many spillovers and other obstructions to deal with in the wash itself. As the trail climbs above the wash you might notice a couple of very faint pictographs high up on the canyon wall on your left. Continue on the intermittent trail as it wraps around the cliffs above the wash. Near the 1.7 mile point from the trailhead a wide gap in the cliffs appears. It is at this point that the Old Woman Wash Loop branches off on the left. The trail to the Unexpected Panel crosses the open space where it continues to follow the contours of the cliffs somewhat. There is another panel of petroglyphs and some faded pictographs at the point of a cliff that we marked in this photo that you might want to check out on the return trip. They are included in the Youtube slideshow at the end of this post. 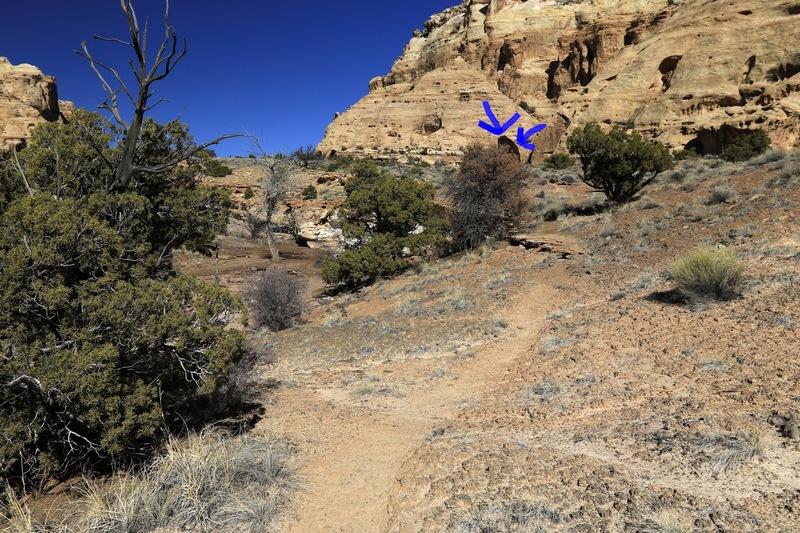 As the trail wraps around the cliffs stay to the right when any side canyons come up. Near the 2.5 mile point the trail passes a survey marker at a section corner. Every so often you can look up ahead and see a high canyon wall sticking up on the right side of the canyon near the head of Old Woman Wash. The Unexpected Panel is in the valley below those cliffs. The drop in point is along the rim not too far from the wash itself. 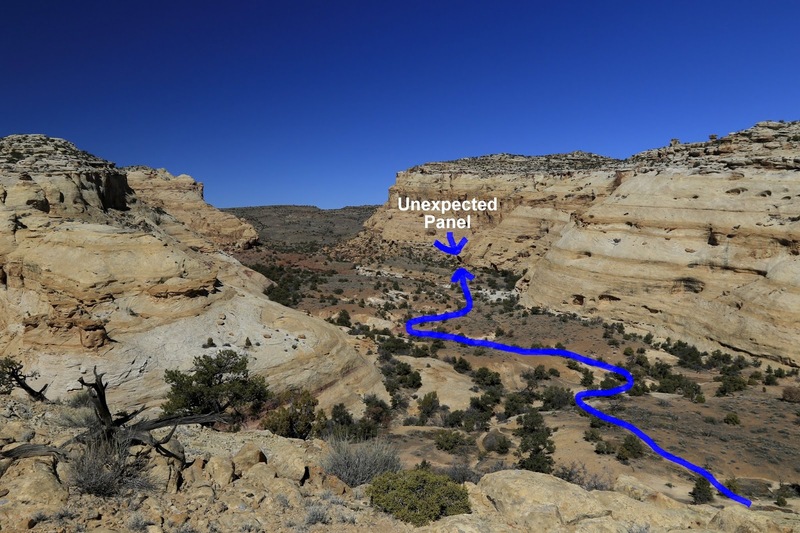 If you try to hike straight to it you will end up going around some minor washes and ravines so it is best to sweep your way around in that direction being careful not to get on too high a ground. There is a brown layer of sandstone that you can aim for in that direction. The goal is to stay just below it as you hike around it to the rim of the canyon. 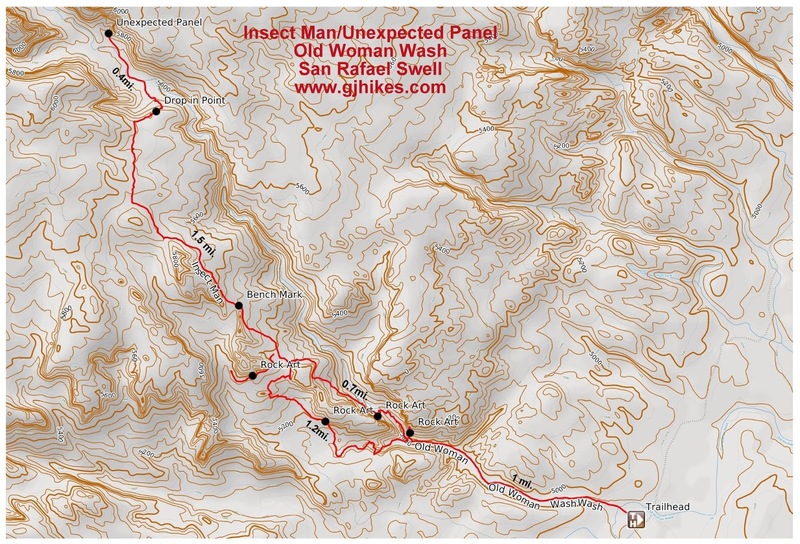 When the trail reaches the rim of the canyon you can see a trail down in the valley that leads from the base of the cliff below to the wash. A quarter mile or so down the wash is another well worn trail that leaves the wash and heads straight to the Unexpected Panel that is on a large boulder that is set apart from the canyon wall. There is another well worn trail along the rim that leads to the gap in the rocks. You could probably go around the gap on the left but it is definitely more fun to go through it. Once we got through the gap we took a roundabout route the rest of the way down the cliff. On the return trip we scrambled up a more direct route that required obtaining a good friction bite on some pretty steep slickrock. The key objective while hiking down the wash is to spot the trail that leaves the wash and heads over to the rock art which at this point is probably still a good hundred yards or more away. There is an 'other wordly' looking image that immediately captures your attention when you first glance at the panel. We were once told that this was called the Insect Man but someone that is more familiar with Barrier Canyon style rock art, and this area in particular, told us that the Insect Man is actually located closer to the mouth of Old Woman Wash. There are some other very intriguing images as well on the boulder. The artist made use of white paint to highlight a few aspects of some of the images. Some of the detail has faded over time and some of the images have unfortunately been almost completely washed off the rock. In the lower left hand corner of the rock there is a Barrier Canyon style petroglyph that looks like a 3 legged man with bug eyes. Speaking of rock, if you hike around the left side of it you will find a cavity that may have served as a rock shelter at one time. When we took the photos for this post we ended up hiking about 10 miles altogether while we explored some of the side canyons looking for more rock art and such. A lot of rock art is so old and faded that it is hard to spot even when you are standing 5 feet away. One of the things that makes this site so special is all the detail in some of the images that is still easy to make out. This trail would be a good option for backpackers as an out and back or by looping around through Farnsworth Canyon where there is more rock art and several natural arches. If you are camping be sure not to camp right on any trails or at any of the rock art sites but rather try to find a spot where you can be off by yourself. However you decide to do it the Unexpected Panel is well worth the visit. If you would like to see it for yourself then all you have to do is 'Take a hike'.